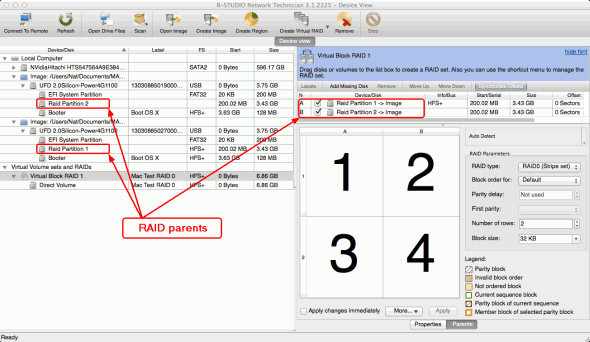 A typical virtual RAID setup for such stripe set is shown on the Fig. The virtual RAID should be created from the Raid partitions. The RAID parents should be placed in the correct order. The Block size parameter may have other (non-default) values: 16KB (32 sectors), 64KB (128 sectors), 128KB (256 sectors), and 256KB (512 sectors). Please remember that stripe sets (RAID 0) don't provide any means to protect data against its lost due to disk failure. If any disk from such RAID layout physically fails beyond recovery, all data from the entire RAID setup will be lost completely. If all disks of a stripe set (RAID 0) are healthy and no data on them is corrupted, R-Studio should be able to re-construct it structure and recover its files.